Remove and install tri-functional bushing easily while the suspension remains on the trailer. 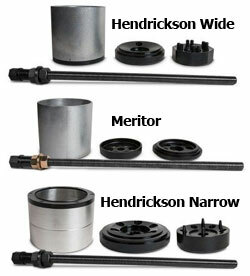 Chose from Meritor, Hendrickson narrow and Hendrickson wide. Note: Use replacement parts and accessories provided by tiger tool only. All replacement parts and accessories are available. Keep hydraulic coupler protected when not in use. Dust caps should be used on couplers when not in use to avoid contaminants from entering the hydraulic cylinder and power source. This practice will help to extend the life of this product and ensure continued consistent operation. Scribe the bushing orientation on the beam tube and compression tube. Assemble tool as shown. The spring pins are not required to line up with the bushing holes during removal. Tighten retaining nuts to remove slack. Thread on hammer adapter in the event the bushing becomes seized. Hook up hydraulics and begin removal operation. Lubricate the bushing (Use OEM recommended lube) and insert the bushing into compression cylinder. Place the plunger on top of the bushing, align the mark on the bushing with the mark on the plunger. The 4 corresponding pins to the bushing type you are installing should seat into the bushing.